This is the first of a series of blog posts on the Brazilian crisis by Felipe Rezende. The political crisis has two main pillars: a) a vast corruption scandal (with evidence of a kickback scheme funneling billions of dollars from state-run firms and, more recently, in a massive data leak over possible tax evasion, Brazilian politicians linked to offshore companies in the Panama Papers); and b) impeachment proceedings to move forward against President Dilma Rousseff. The Federal Court of Accounts (TCU) announced in 2015 that it had rejected the accounts of Rousseff’s administration for the year 2014. In a unanimous vote, the TCU ruled Dilma Rousseff’s government manipulated its accounts in 2014 to “disguise fiscal deficits” as she campaigned for re-election. The allegation is that Ms. Rousseff manipulated Brazil’s account books to hide a growing fiscal deficit. The argument is that the federal government borrowed money from public banks (which is forbidden by the Fiscal Responsibility Law) to pay for social programs. So, they argued she allegedly committed an administrative crime. Once we understand how the government spends and what bonds are for, then we can analyze TCU’s decision. The Treasury has an account—known as Treasury Single Account—with the central bank. When the Treasury spends, its account with the central bank is debited and the bank’s account with the central bank is credited. This is followed by a credit to the beneficiary’s bank account. That is, the public bank then makes payments to the social program beneficiary by issuing deposits (Case 1). The theoretical and policy arguments for monetary reform are becoming more accepted by economists and establishment figures. The financial crisis blew apart the idea that deregulated private money creation by commercial banks leads to more efficient outcomes and allocation of capital, as has been noted by Martin Wolf of the Financial Times and Lord Adair Turner, amongst others. Yet there are few examples of how public money creation – and its variants – can support economic growth without causing negative side effects, not least inflation. 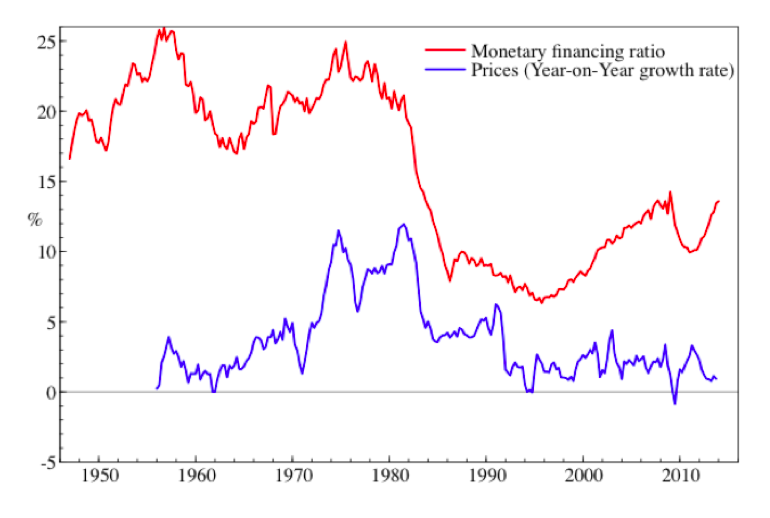 In a new working paper, I examine the case of the Bank of Canada (the Canadian central bank) in the 1935-1975 period, perhaps the most interesting example of public money creation in the 20th century in the English speaking world. Throughout this period the Bank of Canada engaged in significant direct or indirect monetary financing of government debt. In other words, the central bank created new money that was credited to the government’s account either via purchase of government bonds or direct lending. On average, about one-fifth of government debt was financed and held by the central bank, with all interest returning to the state (Figure 1). This monetary financing supported the Canadian state to recover from the Great Depression, fight World War II, enable post-war reconstruction and, in the 30 years following the war, enjoy the longest period of economic growth and high employment in its history. The Bank also created one of the worlds’ largest industrial development banks for the financing of small and medium sized enterprises (SMEs), eventually providing a quarter of all loans to SMEs, again funded via public money creation. Don’t miss this post by Scott Fullwiler at New Economic Perspectives. Fullwiler is reacting to Clive Crook’s Bloomberg column advocating “helicopter drops” (having the Fed simply send checks to households). Helicopter drops or “helicopter money” proposals are widely cast as monetary policy operations (Crook describes helicopter money as a monetary-fiscal “hybrid”) and defended as either preferable to fiscal stimulus or as the only remaining option in light of political obstacles to increasing government spending (to wit, the GOP Congress/Dem White House combination). I find it completely counterproductive to have a theory of macroeconomics in which we define fiscal policy and monetary policy based on who is acting. If the US Congress and Treasury choose to send $1 trillion to households without raising taxes, it’s called fiscal policy. But if the Fed does the exact same thing, it’s apparently called monetary policy. I think this only confuses our understanding of the macroeconomic policy mix and makes it more difficult to have an economics profession that can give good policy advice. It seems much clearer to simply say that (a) the act of creating a deficit—raising the net financial wealth of the non-government sector—is fiscal policy, and (b) the act of announcing and then supporting an interest rate target with security sales (or purchases, or interest on reserves)—which has no effect on the net financial wealth of the non-government sector—is monetary policy. In the case of (a), whether the Treasury or the Fed cuts the checks, it’s fiscal policy, and with (b), whether the Treasury or the Fed sells securities, it’s monetary policy. In other words, fiscal policy is about managing the net financial assets of the non-government sector relative to the state of the economy, and monetary policy is about managing interest rates (and through it, to the best of its abilities, bank lending and deposit creation) relative to the state of the economy. This is in fact how Randy Wray explained both in his 1998 book; it’s also how Warren Mosler explained them in his 1996 paper. That is, from the beginning, MMT has labeled monetary and fiscal policies by their functions, not by who was doing what. I think this is a much more useful taxonomy because it makes clear from the start that (1) the currency-issuing government isn’t constrained while (2) the interest rate on the national debt is a policy variable. All kinds of human suffering the past 6+ years may have been avoided if those two basic points were widely understood. Fullwiler spoke at the last Minsky conference on issues related to central bank operations (actual, vs. textbook): you can hear his remarks here; slides here.